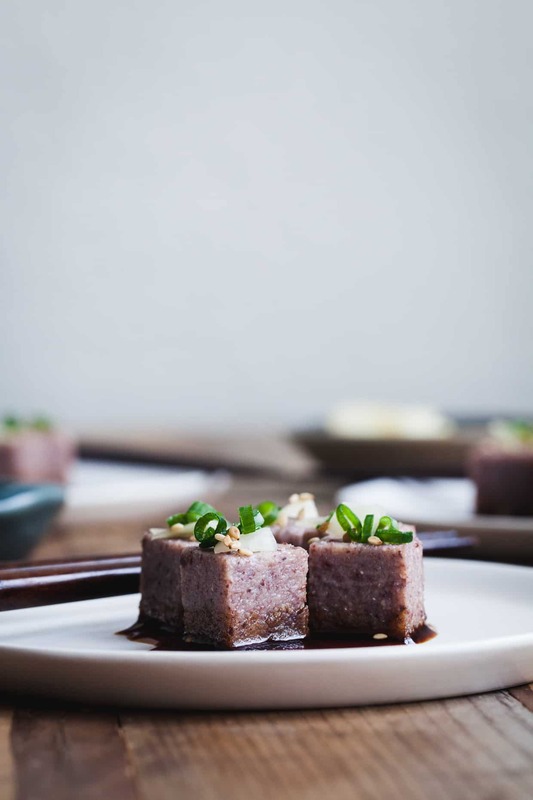 This adzuki bean tofu hails from the Japanese-inspired Alternative Flours Feastly dinner Phi and I hosted in February 2015. While I still not-so-fondly recall the insane amount of work this 6-course plated meal for 14 people took to put on the table, it also forced out some pretty badass recipes (chestnut flour pasta, black sesame and wild rice crackers, and kinako black sesame millet crumble). 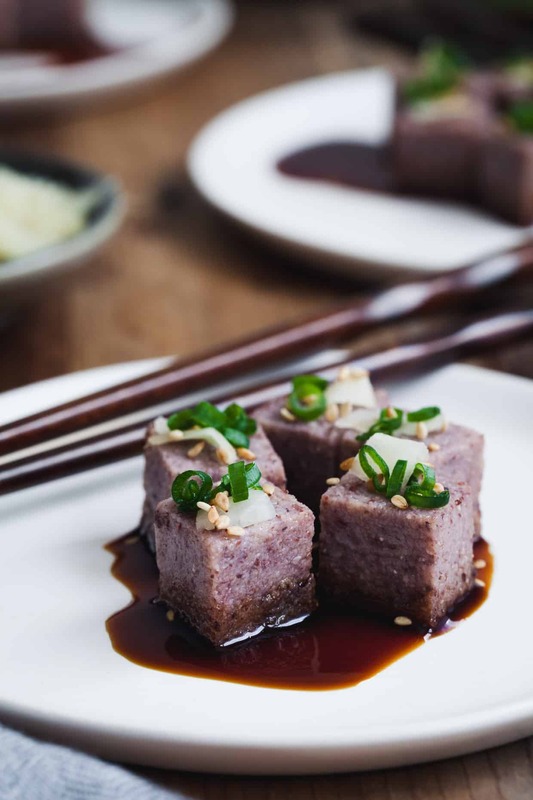 This adzuki bean tofu is no exception. Why I’ve been hanging onto this particular recipe for well over a year kind of makes me a jerk. After two full days cooking and styling for the NYT with Alanna, Lucas and I threw one last housewarming dessert party shindig two weekends ago to see all our local friends before we inevitably disappear for at least a month while we figure out what to do with all the baby poop (real talk). In true Sarah style, I planned an extensive dessert menu (mochi cake, chocolate cupcakes, rice crispy treats, oatmeal cookies, a rosemary apple galette, and salted caramel fondue with dipping apples) with mulled hot apple cider brewing on the stove. And I also planned to make it all the day of, obviously. Meanwhile my parents were in town – mom for grandparenting class (and then allofthedishes – thank god) while we wrangled my retired-contractor dad into helping Lucas run plumbing and electrical to move our washer and dryer from inside the house to the garage to make space for a home office. In heavy rainy mud. The day of the party. NO BIG DEAL. But now I’ve got a custom-built desk in our tiny house(!!). That conveniently still has cold and hot water spigots attached to the wall next to my desk chair. You know, in case I suddenly get…thirsty? By party-o-clock, my ankles had swollen to the size of grapefruits, but we pulled it off (hats off to party guests like Karen who offer to sweep my floor and slice apples). I plan to stay off my feet until I’m at least 15lbs lighter (aside from 20 jumping jacks a night between now and labor – that will work, right?). In all seriousness – I complain now, but when all is said and done we get a soft snuggly baby that smells so good. So worth it. Back to this soyless “tofu.” The idea for adzuki bean tofu came when I stumbled across Sarah’s genius chickpea tofu from My New Roots while holding onto a bag of adzuki beans I’d planned to mill into flour. I figured beans were beans and, using her same method, I swapped out the chickpea flour and turmeric/garlic seasoning for home-milled adzuki bean flour with sesame oil and ginger. The texture of this “tofu” is heavenly – incredibly creamy and tender, while still holding together when gently fried. 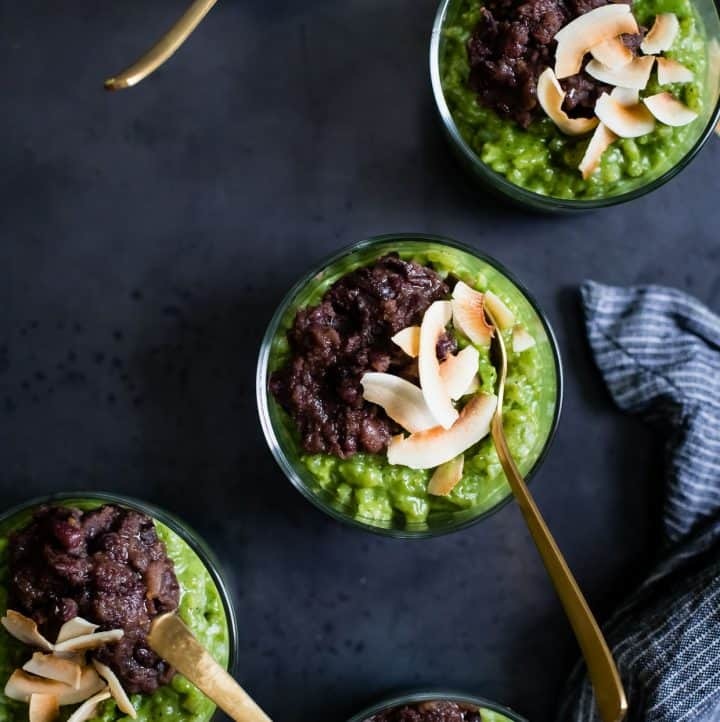 Usually served in various Asian desserts in sweet red bean paste form, the toasty nuttiness of adzuki beans also makes for a flavorful vegetarian protein in savory dishes. 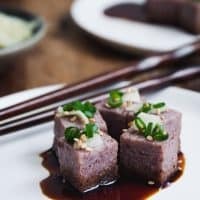 The simplicity of flavors in this bean tofu gives it versatility – serve it as an appetizer lightly seared topped with tamari sauce, scallions, pickled ginger, and toasted sesame seeds as I’ve done here, toss it over salad with sesame vinaigrette, or fry up thin slices for the top of a veggie stir-fry. Used in traditional Chinese medicine, adzuki beans are thought to strengthen kidney and bladder function, and support reproductive health. A magical bean! But not that kind – they’re considered the most easy to digest legume, so they won’t give you gas. Plus adzuki beans are low in calories and fat but high in nutrition to fill you up quickly with less caloric intake. 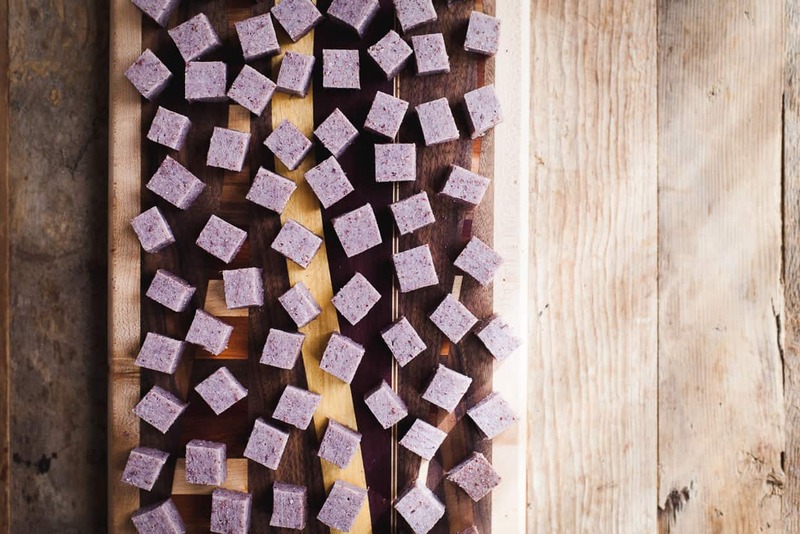 With all that combined with its vibrant purple hue, you should probably make adzuki tofu for your Valentine and follow it up with this strawberry red bean mochi for dessert. 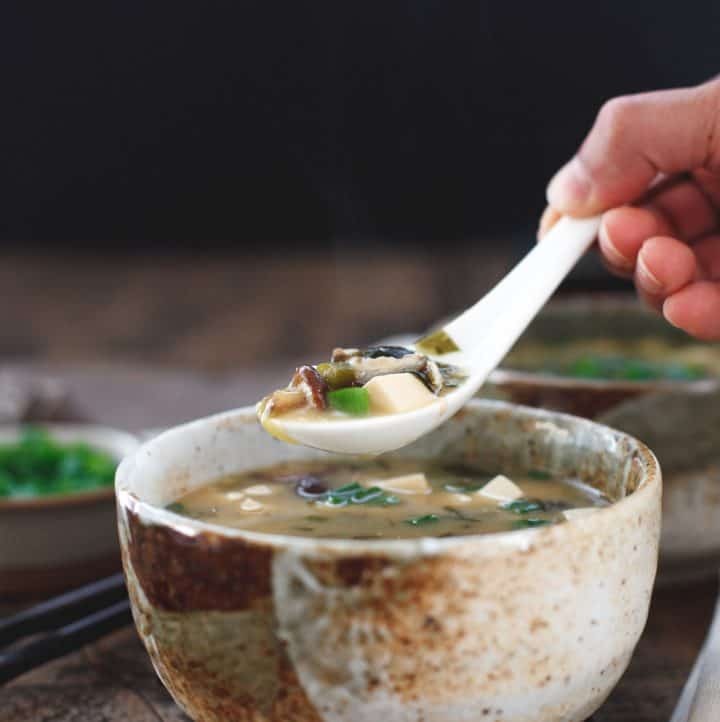 The process involved in making this recipe is pretty foolproof and hands off – the most high-maintenance part of making adzuki tofu is turning your beans into flour. I ran mine through my KitchenAid grain mill, but even if you don’t have an electric grain mill, you’ve got options (high-speed blender, hand mill, or coffee grinder). 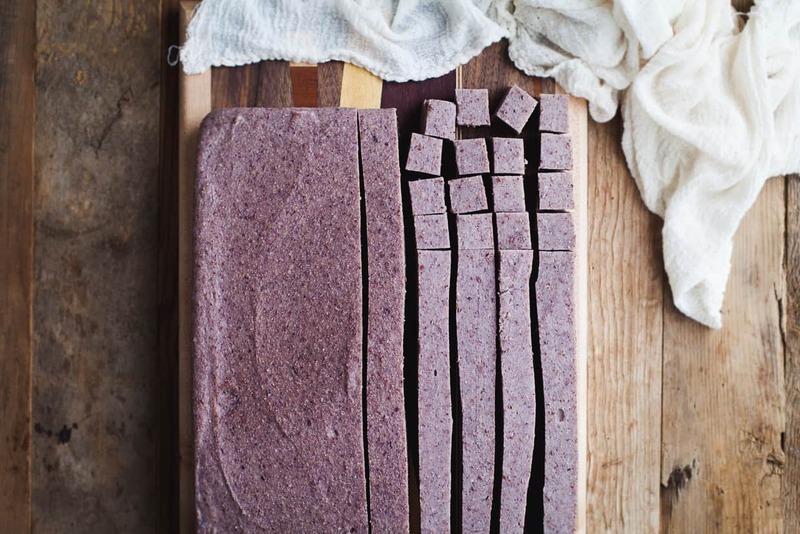 Check out Erin’s post on the tools for grinding your own flours to read about them all. In a large stock pot or bowl, stir together the adzuki flour and water. Cover the pot and let it sit over night for about 12 hours. In the morning, without disturbing the pot, carefully ladle and discard 6 cups of water off the top. Line a 9x12 baking dish with a tea towel or cheese cloth. In another large pot, heat the sesame oil over medium heat. Add the ginger and cook until fragrant, about 3-4 minutes. Without disturbing the sludge at the bottom too much, gently pour the remaining water off the top of the the large stockpot over the fragrant ginger. Add salt and cook, stirring frequently, for 20-25 minutes, until it simmers and begins to thicken. Slowly add the adzuki bean sludge into the simmering water. It will almost immediately thicken. Cook, stirring vigorously to avoid burning the bottom of the pot, for 10 minutes until the mixture thickens almost to the consistency of thin mashed potatoes or polenta. Pour the thickened mixture into the prepared pan and smooth out the top. Fold the edges of the cloth over and let sit at room temperature for 8 hours. Slice and eat immediately or store in the refrigerator for up to one week (or share half with your friends...). 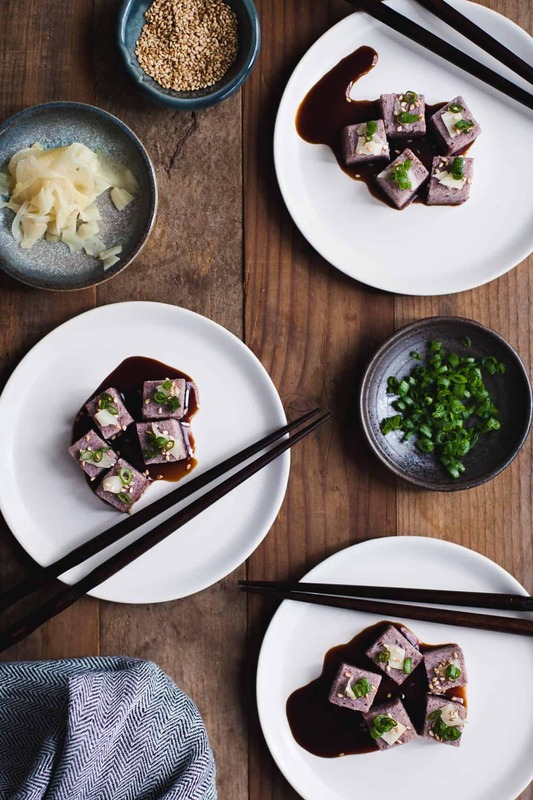 My favorite way to serve the tofu is to fry up cubes in a thin layer of sesame oil over medium heat for 1 minute and serve over a few drops of tamari sauce topped with scallions, pickled ginger, and toasted sesame seeds. It also goes well in salads or seared and thrown over stir fry. *I grind my adzuki beans using my KitchenAid grain mill attachment. If you don't have an electric grain mill, you can grind the adzuki beans in a high-powered blender (like a Blendtec or Vitamix), with an less expensive hand grinder, or slowly in a coffee grinder. Previous Post: « 30 Cheesy & Sweet Baby Shower Treats – A Virtual #CheeseBabyShower & Maternity Photos! This is gorgeous Sarah! I love the colors! I love that your mom is going to grandmothering classes. As if she needs tips after sewing your baby an entire wardrobe! PS I have never even heard of adzuki beans. You are awesome. Hello, my name is Lily and I am officially in love with you. HOLY MOTHER OF ALL TOFUS. This. Is. Exquisite. Bowing down to kiss your tired, swollen feet. This just made my week. I cannot wait to try it. <3 <3 Will you be my Valentine?? I hope you LOVE IT! Betty!! I felt like I was channeling you and all your creativity with this post (no joke). Been thinking about you too!! Thank you so much for your sweet words! 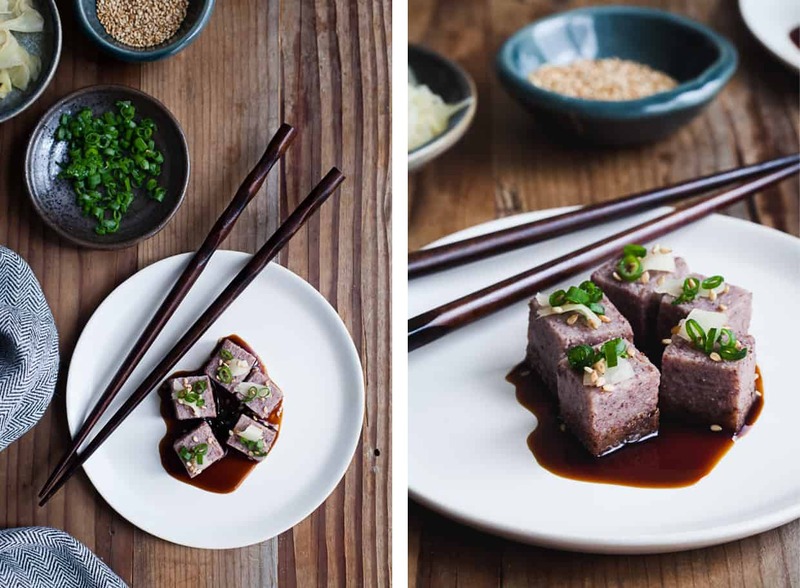 Who knew tofu could be so beautiful!! You’re making the tofu blush (oh wait – that’s just the beans working their pretty magic). Hehe. 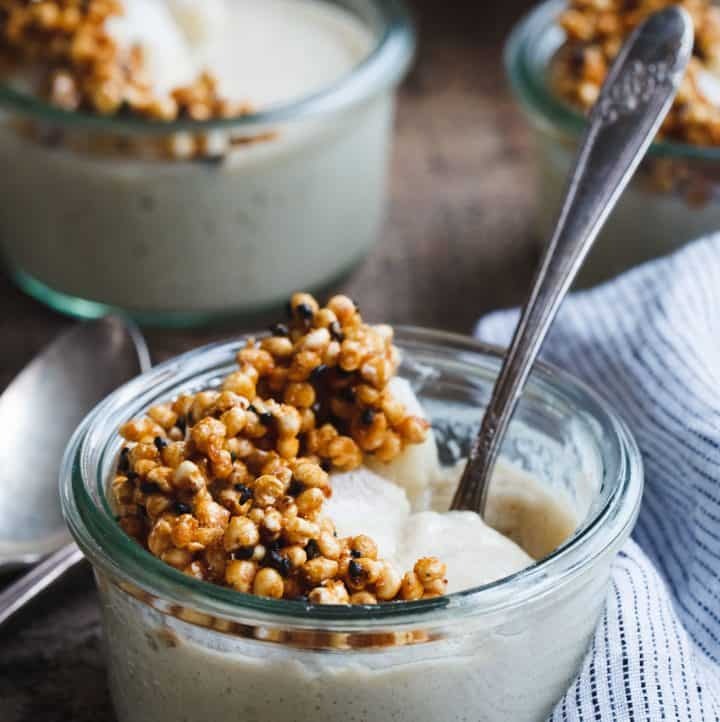 Adzuki beans are just one of my favorites in sweets – this is the only time I’ve ever had them savory (unless maybe when we were on our honeymoon?). You definitely need to give them a go! Thank you so much for your sweet note – my feet are much better this week since I’ve been staying off of them! But I’m certainly ready to meet this lil’ lady! Hope you’re well too! xoxo! I’ve always wanted to try my hand at homemade tofu, but I’ve been much too intimidated :) Thanks for making it look effortless and beautiful, Sarah! This is exquisite, Sarah! I don’t think I’ve ever had Adzuki beans before. You’ve officially peaked my interest. I hope as I’m writing this comment #cheesebabygirl is on her way!! I WISH she were on her way – we just can’t wait any longer! You should definitely seek out adzuki beans – a good starter way to find them is sweetened for desserts at an Asian market! Pairs perfectly with matcha or mochi anything. 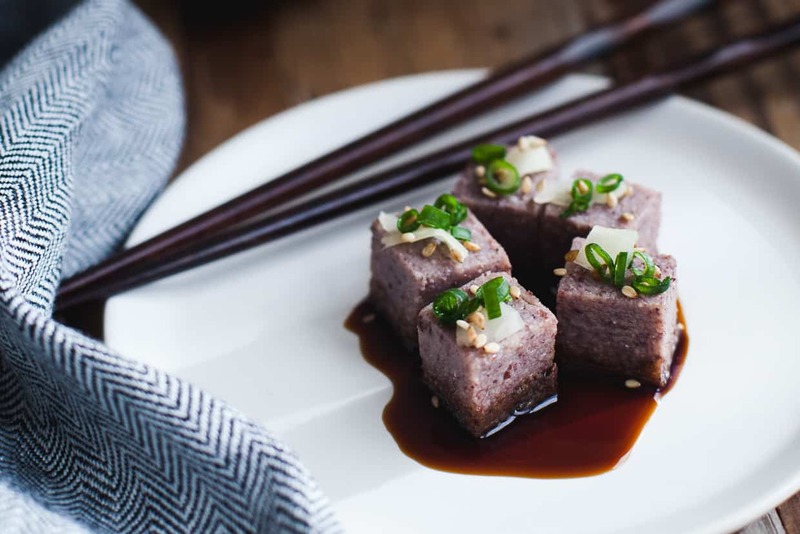 This adzuki bean tofu is STUNNING! All the flavours sound so perfect, too. You seriously hit this one out of the park! Also, I want a grain mill so bad. Someday! Thank you so much! It’s those pretty beans doing all the work. I highly recommend the grain mill – allows you to experiment with so many new flavors! Um, everything from that dinner sounds amazing but this tofu is just totally gorge! Aw – thank you so much! I wish you could have dined with us! You.Amaze.Me. Seriously, is there anything you cannot make Sarah? And that party? I feel like I would get myself into the same sort of situation, but I’m still so impressed and I bet it was lovely. I still wish my trip would have aligned with the date of your Feastly dinner, it would have been amazing to be there! Olive oil or peanut oil would both work for making the tofu – you could really use any oil! If you want to sear it, I’d just use an oil you love the flavor of – so peanut oil would be great! 1. You impress me ALL THE TIME. 2. I don’t think Sean has forgiven himself (or me?) for missing your party. 3. I LIKE HOW YOU SMOOSH THINGS INTO DAYS. 4. MMmmm, this looks as incredible as it sounded. YASSSSSSS. Can I use mong bean instead of adzuki bean ? 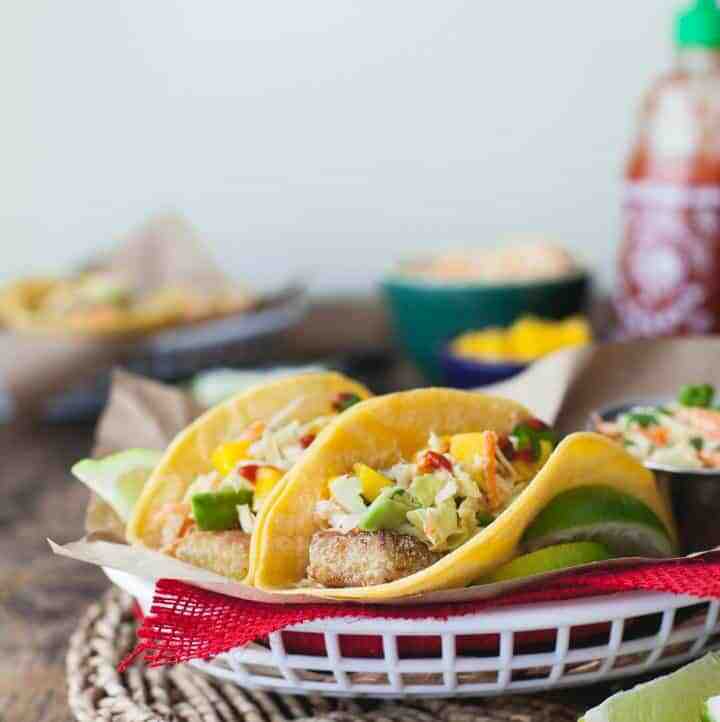 I’ve never used mung bean to make it, but I assume it would work just the same! The recipe I adapted this one from used chickpea flour and it was the same process. Thank you so much for your post and advise. I made it with chickpea before and Adzuki tonight. My husband loves mong beans , I will try it soon. If I wanted to make this and store it in the freezer as a staple, do you know how it wold hold up ? I am the only vegan in the house and would love to make this as my hemp tofu replacement. I have tried freezing it, but I haven’t eaten it from the freezer yet, so I am not sure how it’d hold up! I feel like it might get soggy when defrosted. I’d recommend starting with a half batch instead of making a lot and freezing it! I’ll let you know once I defrost this batch! Oh man – we had our fridge/freezer go out last fall and I lost everything in the freezer :( I need to remake this and try freezing again! Thanks for sharing your recipe. 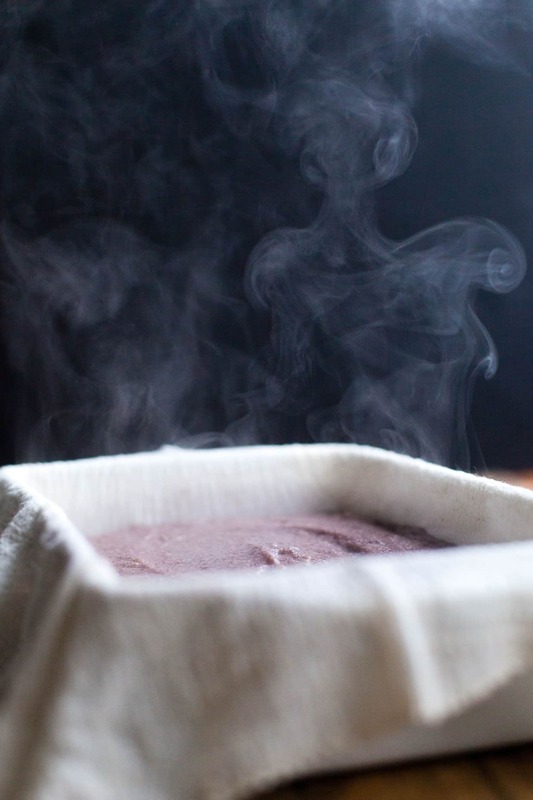 I have a question… How can I make adzuki bean flour from dried adzuki bean? Thanks! I grind mine with a food mill attachment for my KitchenAid stand mixer! Followed the recipe to a T and the tofu turned out very soft. The tofu cubes broke apart when I tried to remove them from the pan after frying…but they tasted delicious. The outside were crispy and the red bean filling oozed out like a lava cake when I bit into it! Is that how it’s supposed to be or did they have too much water? Hi! When you pulled the tofu block out of the 9×12 pan after letting it sit for 8 hours, was it firm? If so, then that’s a sign that you made it correctly! You can eat these so many ways – even not fried as cubes in a salad, for example. I liked to fry the cubes very delicately in small batches (not tossing them, but lifting them out of the pan with a thin metal spatula or using tongs) – the outside will get crispy while the inside gets smoother/softer when cooked (though not like lava cake for me – I wonder if you fried it too long perhaps so they got much more soft?) Hope this helps! I really want to try this! How many grams whole Suzuki beans will yield 3 cups / 450g flour? Or is it 1:1? Thanks! It should be approximately the same! I did not weigh the beans before I ground them into flour, but the internet says 3 cups dry beans weighs 453g, so should be about the same! Hi, this looks very nice. Do you think that its possible to sprout the beans before grinding? Hmmm – I’ve never sprouted beans before, but you need the beans to be very dry before grinding or you’ll end up mushing up your flour grinder, so I”m not sure it would work unless you then also dehydrated them after sprouting.